Get even more mileage out of Shure's legendary SM58 with the ULXS24/58 wireless microphone system. With this system you'll get the same great sound quality you've come to expect from Shure's SM58 unidirectional, cardioid dynamic microphone. With it's incredibly effective spherical filter to eliminate "pop" noises, tailored vocal response, and rugged construction, the SM58 is the choice of professionals. Add to that the ULX2 handheld transmitter and you can take the SM58 almost anywhere. The ULX2 features adjustable gain control, an input attenuation switch (0dB for low output to 20dB for high output), and an eight to nine hour battery life. This system features not only the SM58 handheld mic and the ULX2, but also the ULXS4 standard receiver. This receiver provides exceptional value for musicians and sound installers alike. With features that provide a direct path to full, clear audio signals, the ULXS4 offers a performance unmatched in quality and price. 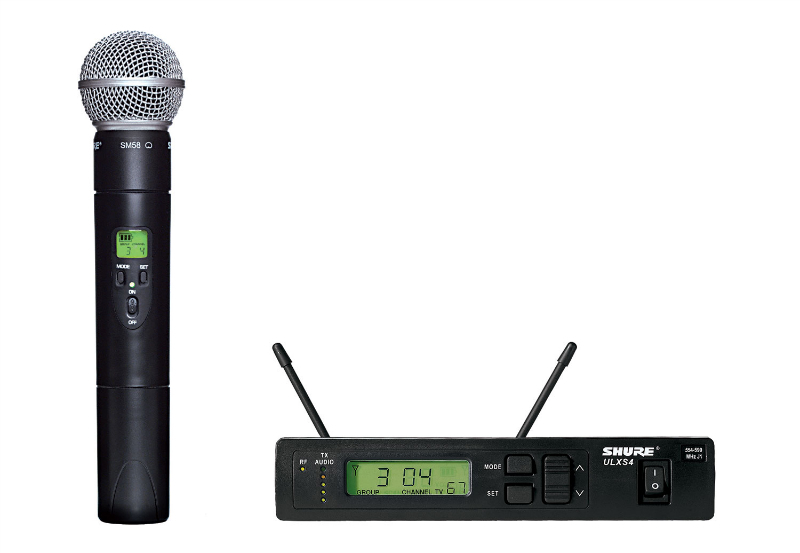 Order the Shure ULXS24/58 wireless mic system today and receive free ground shipping!